EXTERIOR BOX DESIGN AND COLOR MAY VARY. Only nature could create such a perfect gift, guaranteed to thrill whoever receives it The mystery and excitement that goes in the process of opening the oyster and finding your very own special freshwater cultured pearl is unmatched. 5-Tool to open oyster (Butter knife can also be used with caution). A major appeal of this unusual gift is the excitement and mystery as the recipient opens the oyster and finds their very own freshwater cultured pearl. It takes three to five years for the oyster to form the freshwater cultured pearl. The freshwater cultured Pearl color will vary and some pearls are dyed. Exterior packaging color and design may vary. Pearl color: Will Vary, Pearl uniformity: Good, Pearl Surface blemishes: Very lightly blemished. HIGH QUALITY, ATTRACTIVE PACKAGING, BOTH Cage & Chain are Solid Sterling Silver Stamped 925 and tested in lab. Kissing dolphins Pendant measures 0.9"
GREAT GIFT for women, boys or girls. Perfect gift for wife, girlfriend, daughter,son, granddaughter, grandson, grandmother, niece, nephew, sister, brother, friend, coworker, bride, bridesmaids, maid of honor, or a gift for the woman who has everything. Nature lover of any age will be thrilled to receive it. FUN FAMILY ACTIVITY. Harvest your own Genuine Freshwater Cultured Pearl size 5~7mm. Pearl color and shape will vary. Pearl could be white, cream, pink, purple, peach or black, black pearls are dyed. PERFECT GIFT FOR ANY OCCASION. 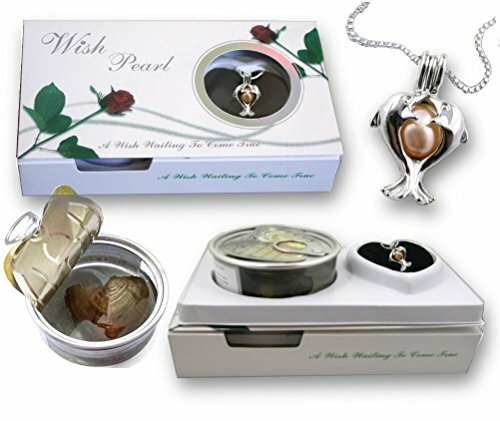 Our DIY Jewelry wish Pearl kit and Love Pearl kit make a great gift for birthday, Christmas, anniversary, valentine's day, graduation or for any occasion. AROMATHERAPY DIFFUSER. Locket can be used as Essential oil diffuser by putting a Lava stone or a mini pompom with few drops of perfume in it. Trendy in summer, winter, or any season. If you have any questions about this product by Pearlina, contact us by completing and submitting the form below. If you are looking for a specif part number, please include it with your message.